To have a successful trade show experience, partner with a logistics team to start planning early! Trade shows are an excellent opportunity for businesses looking to market their products. You and your company should determine what a successful trade show would consist of. If you’re only thinking about the results of the trade show, but haven’t given much thought to the process leading up to it, it could spell trouble right out of the gate. 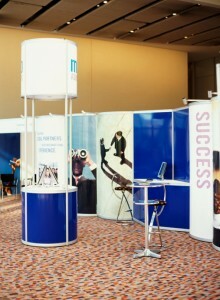 Did you know that experts advise companies to begin planning for a trade show one year ahead of time to ensure success? To set yourself up for a successful trade show, start planning early and utilize the help of an experienced expo logistics company. Planning for a successful trade show will require careful and prompt planning. In the world of trade shows, strict timelines are the norm and can be quite a headache for the inexperienced. But contacting AFP Expo Logistics ahead of time puts you and your company in the hands of an experienced and highly skilled expo logistics company. We’ve built a reputation for timeliness through hard work, so you can be sure that your exhibit, trade booth, or anything else will be there when and where you need it. We work hard to make sure your shipment arrives on time, every time. AFP Expo Logistics is Here to Help! A great expo logistics company will handle all of your time-critical shipments so you can worry more about what you’re good at – advancing your business and selling your product. You’ve invested a lot of time into your exhibit, and you don’t want any part of it to be too early, too late, or not even show up at all. Let AFP Expo Logistics handle that worry for you. We’ll work with you at every stage of the preparation process to ensure that you and your company have that successful trade show you’ve been dreaming of. This entry was posted on Thursday, February 2nd, 2017	at 2:50 pm	and is filed under AFP Expo, Trade Shows	. You can follow any responses to this entry through the RSS 2.0	feed. Both comments and pings are currently closed.